Every day ups and downs, a diabetes blog: Frestyle Libre available on prescription. Again. 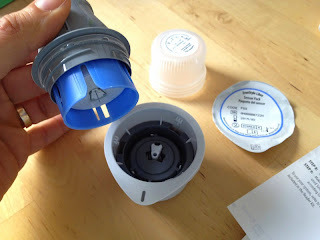 It's with a certain sense of deja-vu that I mark World Diabetes Day this year with the news that Abbott's Freestyle Libre flash glucose monitor will become available to people with type 1 diabetes in the UK on prescription from April 2019. Cue inevitable Twitter meltdown. Hang on... haven't we been here before? Well yes. And no. You may remember me writing a post in September last year on this very subject. Technically the Libre was made available on prescription on 1st November 2017, "subject to local healthcare economic approval". Prior to that 2017 announcement various Big Health and Diabetes Organisations (such as the Regional Medicines Optimisation Committee, NICE and a collaboration of Diabetes UK, ABCD, JDRF and INPUT) put together helpful documents, guidance and national position statements about what Libre was, who it might be useful for and the evidence to support its use. What followed was an unholy scrabble of various different CCGs across the UK who either adopted Libre under RMOC criteria, published their own set of rules (which often had bizarre additional requirements that seemed to bear no relation to Libre and its use, such as blood pressure results) or denied access entirely saying that there wasn't enough evidence, or that they didn't like the colour of the packaging or any number of "Whatever we do, let's kick this can as far down the road as we can manage" strategies. And all the while those CCGs in the 'no' camp had meetings and re-reviewed the evidence that had already helpfully been reviewed for them, and invested time (and presumably money) into reinventing all the wheels they could see. So what emerged was variously described as a 'postcode lottery', 'Libre lotto' and 'bloomin outrage' and across the country people living in the (at the last count) 51 CCGs to have said a big fat NO to prescribing Libre got together and organised themselves to petition, badger and generally make a fuss about it. Meanwhile, in areas where Libre was more freely prescribed, the early results were overwhelmingly positive. HbA1c's tumbled, and importantly positive effects were seen at all starting points, with significant improvements being seen in those who hardly checked BG at all as well as those regularly checking 6-8 times every day. And the results didn't begin to tail off after an initial positive surge either. As more data were added, the improvements were sustained and improved further. Meanwhile the irrepressible, unstoppable force that is Dr Partha Kar was not for taking 'no' for an answer. If the evidence was sufficient for area A, why was it deemed insufficient for area B just down the road? Gentle pressure was applied with an NHS England behatted sledgehammer and a smile. 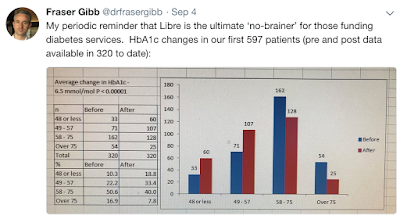 Additionally everyone's second favourite Libre-prescribing-data-muncher Nick Cahm quickly became errant CCG's worst nightmare as he quietly and eloquently sifted through mountains of information to show how utterly nonsensical some of these local decisions were. And Diabetes UK weighed in to support and rally local people in their #fightforflash. The CCGs didn't stand a chance really. So who exactly will have access? Those who meet the current NICE criteria for insulin pump therapy (HbA1c >8.5% (69.4mmol/mol) or disabling hypoglycemia as described in NICE TA151) where a successful trial of FreeStyle Libre® may avoid the need for pump therapy. Those who have recently developed impaired awareness of hypoglycaemia. It is noted that for persistent hypoglycaemia unawareness, NICE recommend continuous glucose monitoring with alarms and Freestyle Libre does currently not have that function. Those who require third parties to carry out monitoring and where conventional blood testing is not possible. In addition, all patients (or carers) must be willing to undertake training in the use of Freestyle Libre® and commit to ongoing regular follow-up and monitoring (including remote follow-up where this is offered). Adjunct blood testing strips should be prescribed according to locally agreed best value guidelines with an expectation that demand/frequency of supply will be reduced. It will be very interesting to see how this works in practice, and in particular whether this framework allows widespread adoption of Libre2 when that launches in the UK (at the same price as Libre1 apparently), which gives Libre users the option of alerts to prompt scanning when BG rises or falls to particular limits. I’m looking to self fund freestyle libre as I don’t fall into the relevant category to be covered by the NHS. I have signed up to freestyles mailing list and have a hospital appointment coming up.